Green or Pink? You decide! Since missing our initial deadline, we took the opportunity (there's a silver lining to every cloud) to further evolve the mask's design and with it, our initial prints. Prior to this, we were just going to go with one print for our initial run (which you can see in action in a previous post). But since we have more time now, Jonlin and I took the opportunity to whip up some additional patterns. The increase in costs for the additional prints is significant per unit, but in the overall scheme of things having some options totally justified it. Below is one of the patterns Jonlin created, but we need your help in deciding whether green or pink would be more appropriate for this mask. FYI, the other masks in our initial batch will be red, white and blue for the good ol' USA! Which color should we offer the above pattern in? I like the small patterns. I think a pink would be nice for the girls. For the girls? I'd totally rock the pink and I'm the manliest man of men. Pink, because a guy would rock the other colors over green, and a girl would prefer pink over the others. Pink! B/c girlz rule! I actually would love a red one :-). pink! cuz that green is not xciting enough... lol. 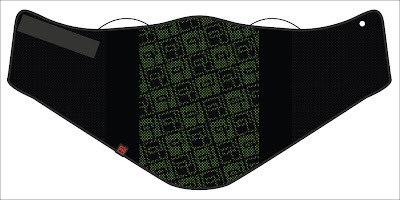 i think this pattern looks better in the green ..
Ah if Shredder's bottom portion of his mask was more recognizable. I considered trying to distill Optimus Prime's lower face into a mask. Didn't quite work out.